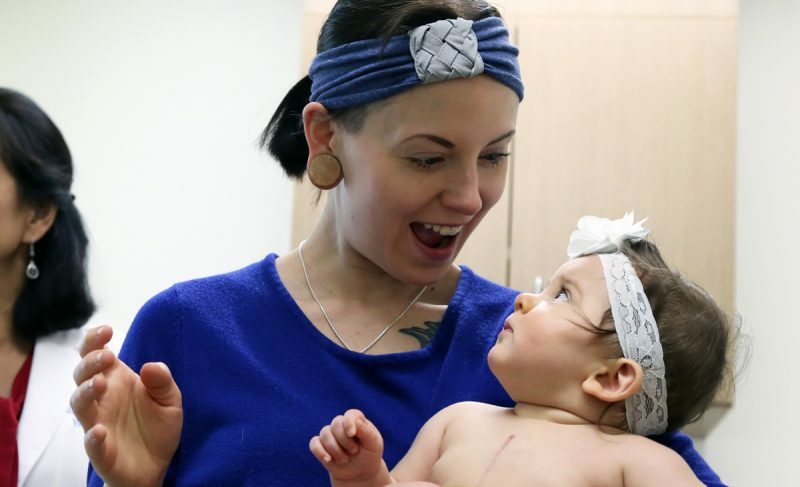 Zoey Ryan was born with a 7 millimeter hole in her heart — roughly the diameter of a pencil. Clinically speaking, her diagnosis of ventricular septal defect (VSD), is a fairly common one for infants, but that doesn’t reassure a new mother who’s been told her baby needs open-heart surgery. 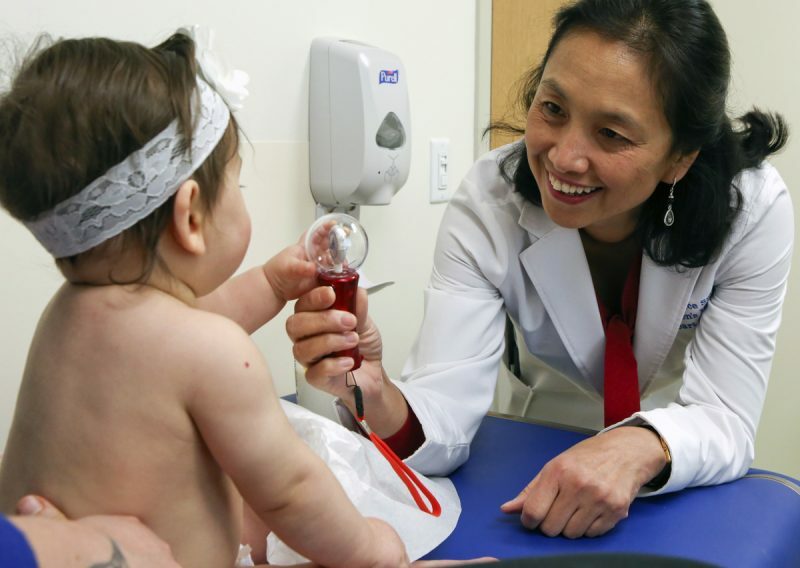 Zoey, from Beloit, was born in April weighing 6 pounds, 8 ounces, and during her first pediatrician appointment 3 days later, her parents asked the doctor about a wheeze and strange breathing pattern they’d noticed. The pediatrician ordered x-rays, and an hour after the family returned home from the appointment they received a startling call. “They told us to call 911 and get her to Akron Children’s because there’s something off on the chest x-ray,” said Katie Huffstetler, Zoey’s mother. The baby was not in distress. Her mother said it didn’t seem like anything was wrong. But they did what the doctor said. After running multiple tests and monitoring her for 5 days, the heart defect was confirmed. Zoey had a large VSD. “They told us a lot of children are born with a hole in the upper chambers of the heart and it closes on its own, but Zoey had a second one and it was very large,” Huffstetler said. Akron Children’s cardiologists told her she would need open heart surgery to patch the hole, but they needed to wait until she was a little bigger and stronger to perform the procedure. 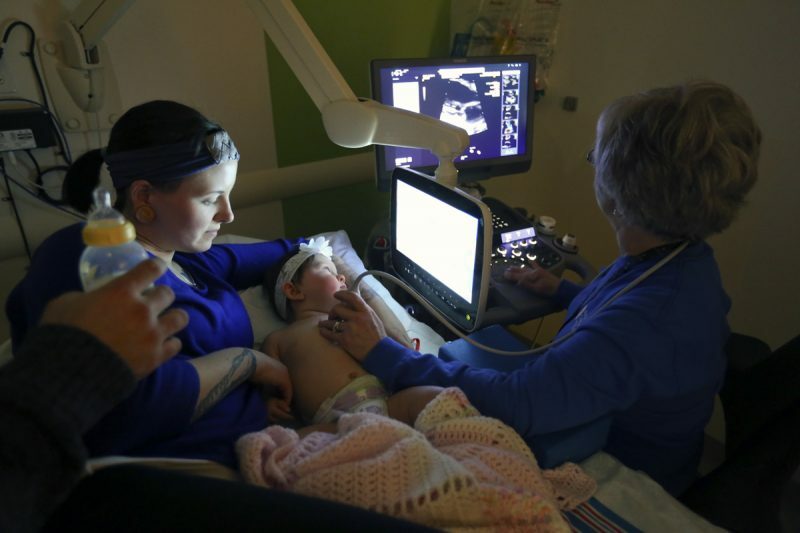 An ultrasound checks Zoey’s heart after surgery. Weekly visits to the Mahoning Valley to be monitored by cardiologist Dr. Grace Smith and multiple trips to the ER for breathing concerns ensued. Finally, at close to 6 months of age she was ready for surgery. Through a collaboration with the Cleveland Clinic Congenital Heart Surgery team, Drs. Michael Spector and Robert Stewart would perform the surgery. They explained to Zoey’s parents they would temporarily stop her heart and connect her to a machine to pump her blood, and after patching the hole and closing her up, her heart would start again on its own. Doctors assured her she was in good hands. Further, a nurse would keep them updated on what was happening in the operating room throughout the procedure. Zoey with her mom, Katie. Zoey’s surgery was successful, but then she needed 48 hours to rest and recover. Her parents and grandparents were near her bedside the entire hospital stay, as were nurses, Huffstetler said. After surgery Katie and her fiancé Jeremy Ryan saw Zoey sedated with a tube coming from her bandaged incision, wires connected to her arms and neck, and with a raspy cough from the breathing tube used during the procedure. She was heartbroken she couldn’t hold her baby to help comfort her. Following those long 2 days, Zoey was taken off the sedation, and the tubes and wires were removed. Dr. Grace Smith checks on Zoey every 2 months. Two months later and Zoey is off all her medications, she’s on very few restrictions and is down to checkups with Dr. Grace Smith at Beeghly campus every 2 months.